The May 23rd elections were always going to be good elections for the Non Party/Independent candidates grouping. With opinion polls in the run up to the contests consistently showing a swing towards Independents, with a tendency for Independents to fare well in local election contests in any course and with a very large number of Non Party/Independent candidates contesting these, the Independent candidate grouping was well placed to claim a very high share of the first preference vote in these contests. And so it transpired. 22.5% of the first preference vote and 194 Council seats were won by Independent candidates at the local election contest, while candidates from this grouping took 3 of the 11 European Parliament seats at the European Elections contest. In all, the Non Party/Independent candidates grouping won 381,644 first preference votes at the local election contests on May 23rd, amounting to 22.5% of the national vote in those elections. This was based on a number of very strong performances by Independent candidates in different parts of the state, but also reflected to some degree the large number (583) of candidates from the Non Party/Independent grouping who were contesting the 2014 Local Elections, up significantly on the 399 Non Party/Independent candidates who had contested the 2009 City and County Council elections. As a result, the proportion of Council seats won by the Non Party/Independents grouping (20.4%) proved to be the share of the vote won by the Non Party/Independents candidates (22.5%), although it was much larger than the proportion of seats won by candidates from this grouping at the 2009 elections. The relatively smaller proportion of seats won as compared to their national share of the vote is down to the fact that Non Party/Independent candidate grouping is a very broad church, containing candidates from all sections of the political spectrum and with radically different prospects of success at these contests. A good number of candidates hailed from the left of the political spectrum – with a large number of these contesting the more urban electoral areas – while there were a large number of Fianna Fail-gene pool/Fine Gael-gene pool candidates contesting these elections, particularly in the wake of a series of “selection defections” in the months leading up to the local elections. People voting for Independent candidates did not necessarily transfer their next preferences onto other Independents in the same electoral area, although intra-party transfers were admittedly not as strong in these local elections as they would be in a general election given that local candidate factors have a greater bearing on transfer patterns in these contests. 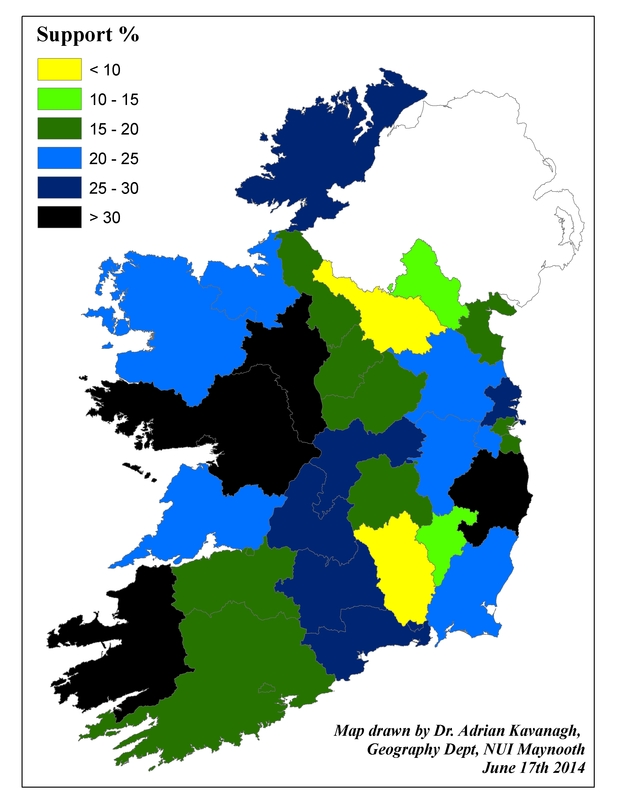 With the notable exceptions of Cavan (3.7%), Kilkenny (7.0%) and Monaghan (11.1%), Independent candidates fared well across most of the state but did especially well in the more western counties and in Wicklow. The largest vote share won by candidates from the Non Party/Independents grouping was in Galway City (37.1%). Non Party/Independent candidates also won over thirty percent of the vote in Wicklow (35.6%), Kerry (33.9%), Roscommon (32.7%), Galway County (32.5%) and Donegal (30.0%). Independent candidates won 14 seats in Tipperary, 12 seats in Galway County and Dublin City, and 10 seats in Cork County, Fingal, Wicklow and Donegal. No Independent candidate contested three of the 137 different electoral areas – Ballyjamesduff, Carrickmacross-Castleblaney and Athy – while votes for Independents accounted for less than five percent of the total valid poll in Cork City North East (2.6%), Bailieborough-Cootehill (2.9%), Kilkenny City-West (3.3%), Cork City North Central (3.7%) and Killiney-Shankill (4.1%). By contrast, Independent candidates dominated the contest in Killarney, winning 60.3% of the votes there, while the next best performances by Independents at the electoral area level across the state came in Tramore-Waterford City West (46.8%), Tuam (44.6%), Greystones (44.2%), Letterkenny (44.0%), Galway City East (43.6%), Galway City West (43.5%), Lucan (42.6%), North Inner City (42.5%) and Donegal (41.3%). In all, Independents won won than forty percent of the vote in ten of the 137 electoral areas across the state. Independents accounted for four of the Council seats in six different areas – most notably in the eight-seat North Inner City and Killarney electoral areas, but also in the nine-seat Swords, Clonmel and Tuam electoral areas and in the ten-seat Letterkenny electoral area. This entry was posted in Local Elections 2014 and tagged 2014, Independents. Bookmark the permalink.